In recent days we have seen an upsurgence of anti Islamic attitudes. These are based on ignorance, fear and in many cases racism. The election of Hamas in Palestine has triggered new fears throughout the western world… ‘another Islamic State’! Education and the spreading of the truth about Islam can change this situation. I was sent this slide show… please click on it, watch it, listen to the words. THIS is the truth about Islam…. not what is written in the western press or spouted daily by the real enemy… the Bushtards. Take a few minutes, watch the whole presentation and then send it to as many people as you can. The truth can change the world! As the Bushtards continue to call on Hamas to reject violence, Israel continues to kill innocent Palestinian children. Hamas DOES reject this violence, there is no doubt about that. The mood in the streets is apprehensive as far as the average Israeli is concerned; one hears ” What will be now? Will there ever be peace?” Questions…. One hears the Palestinians ask the very same questions…. There does not seem to be fear among the Israelis, more, confusion. Among the Palestinians, there seems to be a feeling of pride. Pride in the fact that their people stood up to their enemy and voted the way they wanted. A feeling of hope seems to prevail… hope that Hamas will better the life of the Palestinians. Hope that they will see the creation of a State. Hope that there will not be a war. Let us all hope they are right. The widow of Dr. Martin Luther King Jr. has died. A woman that stood at the side of her husband all through his struggles… suffering herself as she raised her children alone as he sat in prison on so many occassions. A great human being in her own right,she was described by the Rev. Fred Shuttlesworth, a family friend, as a “matriarch of the movement, a patriot of all that America stands for,” in an interview with CNN affiliate WSB-TV in Atlanta. Born in Marion, Alabama, on April 27, 1927, Coretta Scott graduated as valedictorian of her high school class and attended Antioch College in Yellow Springs, Ohio. She received a B.A. in music and education and then studied concert singing at the New England Conservatory of Music in Boston, Massachusetts. She got a degree in voice and violin, according to her official biography. While there, she met a theology student at Boston University, Martin Luther King Jr. They married on June 18, 1953, in her hometown of Marion. As the young pastor began his civil rights work in Montgomery, Alabama, Coretta Scott King worked closely with him, organizing marches and sit-ins at segregated restaurants while raising their four children: Yolanda Denise, Martin Luther III, Dexter Scott and Bernice Albertine. She also performed in “Freedom Concerts,” singing and reading poetry to raise money for the Southern Christian Leadership Conference, the organization which Dr. King led as its first president. The family endured the beating, stabbing and jailing of the civil rights leader, and their house was bombed. After an assassin’s bullet killed her husband in Memphis in 1968, Coretta Scott King turned her grief into the nurturing of her husband’s legacy. She founded the King Center for Nonviolent Social Change in Atlanta, a memorial to her husband’s work and dream. She spoke out “on behalf of racial and economic justice, women’s and children’s rights, gay and lesbian dignity, religious freedom, the needs of the poor and homeless, full-employment, health care, educational opportunities, nuclear disarmament and ecological sanity,” her biography on The King Center’s Web site said. Our lives were enriched having Coretta Scott King live among us. May we all see the fruits of the seeds she planted to make this world a better place for all races. As long as reports like this continue to appear, one begins to wonder who the real terrorists are. Please read the link… it might open a few eyes as to the innocence of the Israelis. Perhaps it should be Hamas that refuses to sit with these butchers. Thanks to Osama Saeed for providing the link and photo in his blog. Murder of children is a crime that cannot be forgiven… and must not be rewarded. Instead of trying to find ways to cope with the situation, the Israeli government has already started its whining. Before Hamas even formed a government, Israel is expecting the worst, sure of the fact that Hamas will be out to destroy them. The Bushtards are feeding this nonsense to the world as well… already stating that they will not negotiate with a Hamas led government. What they are saying in reality is that they will continue their policy of not giving any support to the Palestinian people, for it was them that elected Hamas to represent them. It’s time to give peace a chance… not for violins and condemnations. Hopefully Hamas will try to create an atmosphere assuring all parties involved that they are not out to destroy Israel…. they just want ‘their place in the sun’. Is that asking too much? The Bushtards are already trying to stop Hamas from taking power… it will not work! Israel has been working overtime to come up with the ways and means of never cooperating with Hamas in any way, at any time. A total negation of the wishes of the Palestinians, a literal ‘spit in their face’. The attitude of ‘We’ll allow your statehood, if you vote for who we tell you to’ seems to have become the official policy of the Israeli government. Olmert has already announced that tax money earmarked for the Palestinian Authority will not be sent to them. Netanyahu has made outrageous claims comparing the victory of Hamas to the rise of Hitler. All this before Hamas has even formed a government, before they make it known what their actual policies will be. Israel is creating a situation where any type of negotiations or cooperation will not be possible. They are creating an enemy! Is this not collective punishment? Is this not telling the Palestinians that they will forever suffer under occupation for daring to vote with their hearts? The Bushtards will be proud of their Israeli lackies, surely they will be rewarded for these acions. But the final reward awaits them,,,, elsewhere! WHAT DOES THE HAMAS VICTORY MEAN? The Electronic Intifada has had some wonderful coverage on the situation in the Middle East, Palestine in particular. This analysis of the Palestinian election might answer many questions that my readers living in the West might have. It is definitely worth reading. Another brilliant analysis, also from Electronic Intifada was posted by one of my favourite links, Osama at Muslim Affairs Blog. I am a coca grower. I cultivate coca leaf, which is a natural product. 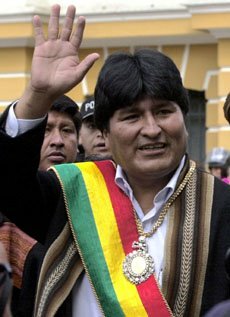 The new government of Evo Morales in Bolivia is cracking down on the illegal production of cocaine. This move should appease Washington in their fight against drug imports. It will be interesting to see Washington’s reaction…if any will be forthcoming. Needless to say, I could not find reference to this move in the western press… is it possible they don’t want their readers to see the true nature of the Socialist beast? The following was sent to me by a fellow blogger, RandomPottins,one of my links… Thanks Charlie.. Since Ariel Sharon was hospitalized, a true disinformation campaign started: Sharon would be ” the man of peace “, his disappearance ” would endanger the peace process “. What peace? Sharon, like his predecessors and his successor, as the members of its Kadima party always promoted colonization: 450 000 Israelis live in the territories conquered in 1967, a figure constantly increasing. Ariel Sharon, like Ehud Olmert (current interim Prime Minister) always promised to establish ” the final border of Israel “. This border, it is the Wall which continues to advance in spite of the judgment of the International Court of the Hague, it is the annexation of Jerusalem and of half of the West Bank, it is the reduction of Palestine to scattered and non-viable bantoustans. The Palestinians have just voted in mass (by giving a beautiful example of democracy) and they gave a clear parliamentary majority to Hamas. The same disinformation shows: ” the process of peace is in danger “, ” there is no partner for peace any more “. The UJFP denounces this campaign. First because the Israeli governments never ceased affirming ” that there is no partner for peace “. And this refrain was used to disqualify Arafat and all the Palestinian political community. Second, because it is untrue to pretend that there are negotiations in progress: Sharon and his government, supported by Washington, installed a unilateral policy with respect to the Palestinians, which applies day after day. For months there have been no peace negotiations with the Palestinian representatives, only meetings to regulate with them problems concerning the safety of the occupant. The constant policy of different Israeli governments is a brutal mixture of colonisation, everyday humiliations, ethnic cleansing, creeping annexation, confiscation of resources and targetted assassinations. Whatever judgements one could make of the various Palestinian parties, the vote which has just taken place is above all a vote of protest and resistance: against the economic strangulation, against the annexations, the policy of the fait accompli, against the destruction of their society, the arrogance of the Israeli governments which mocks them and their representatives, against corruption, and the absence of hope.. The Israeli and American governments who proclaim everywhere ” that one cannot negotiate with Hamas ” did everything at other times for it to develop, and they do all, by their crimes and their refusal to negotiate, to reinforce this formation. Before as after the elections, peace based on equal rights and justice can only come through the end of the occupation, the dismantling of all the settlements, the release of all the prisoners, the right to the return of the refugees and the recognition of the rights of the Palestinian people. AND SOCIALISM IS A BAD THING? Less than a week after Evo Morales was sworn in as President of Bolivia, the ‘boat is starting to rock’. His first moves have been very positive and will assure him a place as Bolivia’s leader for many years to come. Looks like the Bolivian people were right when they voted left! Evo Morales raises a pot full of fake money during the Alasitas miniatures fair in La Paz, Bolivia, on Tuesday. WHAT ARE THE ARABS SAYING ABOUT HAMAS’ VICTORY? As the world ponders the results of the recent election in Palestine, there is much confusion as to what is going on and what will happen. To see the opinions of the Arab Press click on my various links in this thread. AlJazeera has some special reports on the issue, worth reading. Attitudes in Israel are confused at the moment, Washington and the Bushtards are still trying to confuse the issues, but the bottom line remains; Hamas received a majority in the election and will be the representative of the Palestinian people… whether Bush and Israel like it or not! Bush’s reaction can be seen here. Bush in ‘better days’ with Sharon and Abbas… always the meddler… always the idiot! Comments Off on WHAT ARE THE ARABS SAYING ABOUT HAMAS’ VICTORY? The people of Palestine chose Hamas to represent them in their Legislature. This is a fact that Mahmoud Abbas has to live with, a fact that Israel, the United States and the European Union have to accept. Fatah, the party of Yasser Arafat and Marwan Bhargouti has been defeated in the election. Not long ago, it was Fatah that was labled ‘terrorist’ by much of the world. Today, despite every indication that Hamas is willing to change its programme to one more acceptable to others, it is still branded as ‘terrorist. Washington has already indicated that it will not support Hamas in any way. Israel has indicated that the peace process, which was ended by Sharon,will not be revived. Foreign reports have shown that a death warrent has been issued against Hamas, before they even take power. The world has to accept this new reality. Hamas was elected democratically by the Palestinian people. 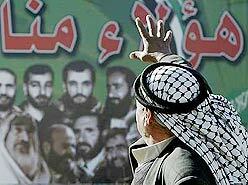 Hamas will be the one that negotiates the future of the Palestinian people. It is up to the world at this point to decide how those negotiations will proceed, as far as the Palestinians go, they decided. As much as the Israeli and American governments do not like it, it’s official, Hamas has won a majority in the new Palestinian Legislature. Of the 132 seats in Parliament, Hamas won 76 and Fatah 43, the election commission announced on Thursday.The top Hamas leader, Khaled Mashaal, told Abbas his group is ready for a political partnership, Hamas said. Mahmoud Abbas will stay on as President of the Palestinian Authority. Palestinian reaction can seen here here in the latest AlJazeera report. Reactions on the Israel side were quite different. There is every indication that whoever becomes the next Prime Minister in Israel will refuse to negotiate with Hamas. Washington’s reaction was not much different. The people of Palestine have spoken. The world has to accept that and work with it. The Bushtards are going to have to accept the fact that the world refuses to be dictated by their commands. It’s a new era for humanity, and the end of one for the Bushtards. was a part of the Palestinian Authority. Nothing is official yet…. but there has been lots of movement in the Palestinian Authority this afternnon. Foreign reports are similar to those in the Israeli press at the moment. I’ll keep my readers posted with updates as the final tally comes in. Hamas election poster in the West Bank city of Hebron on Thursday. Despite every effort by the Israeli Government and the Bushtards in Washington to sabotage today’s election in Palestine, it went ahead as scheduled. The results will not please either of the above mentioned two, but the people have spoken and a new Legislature was elected. Initial reports do not give that much information, but a picture can be seen. The Israeli press has been on alert all day waiting for their scoop…. while some sections of the American press did their usual thing of fabricating reports and feeding lies to their readers. Early reports show a narrow Fatah victory in the polls. despite every effort to keep Hamas off the ballot, they made a strong showing for second place. They have already indicated their willingness to cooperate with a Fatah majority. So… a victory for the Palestinians in that democracy did work for them, and a defeat, the first of hopefully many, for the Bushtards. Further reports will be published when the full picture is available. UPDATE… The links I provided have been updated to show gains for Hamas…. full report when all ballots have been accounted for. that have been meddling throughout the campaign. March, and hopefully Olmert will not be in the picture afterwards. issues with the following remarks..
CNN had this to say about the situation. AlJazeera’s update is also worth reading. So, not much to say at the moment, we must wait for the polls to close and the ballots to be counted. Let us just hope that the process goes along peacefully and without incident. Let us also hope that the people will elect representatives that will serve in their interest and in the interest of a truly just peace between the two nations. Just a few hours left before the voting starts for a new Palestinian Legislature. Todays Israeli press had little or nothing to say about it. This article from AlJazeera has a pretty accurate analysis of the situation. There was much outside interference during the election campaign; threats made as to what would happen if certain candidates were elected. Israel attempted to bar Palestinians in Jerusalem from voting, Bushtards say they will refuse to negotiate if Hamas candidates were elected. As I mentioned before in an earlier thread…’Sure, you can have Statehood if you vote for who we tell you to’. Well….. that kind of logic just does not work in a democracy. The Palestinians will vote for whom they want to… and Israel will have to deal with them. As far as the Bushtards go…. well…. they can go to hell! I ‘lifted’ this thread from my newest link, Renegade Eye. on a visit to a rehabilitation center in the Venezuelan countryside. Latin American chapter located in Buenos Aires. them with wealth,” the Center stated in a letter sent to Chávez. for Latin America, underscored, as quoted by AFP. Let’s look at what he said. This is the original Spanish version. crucificaron a su manera en Santa Marta, allá en Colombia. not talking about Jews or Romans, or Jewish people killing Christ. He is talking socialist allegorical rhetoric in a universal way. The votes are in… the people have spoken. In the words of Jesus, Himself,…”Father forgive them for they know not what they do”…. Canada, the land I called home for 20 years, has taken a BIG step in the WRONG direction. My only thanks is that the Conservatives did not win a majority. It’s a step backwards, but it’s not the end, and must not be the end of the struggle to oust the parties that work only in the interests of the corporations… in this case, the U.S. corporations. The Bushtards will rejoice in this victory as the working people of Canada mourn it. Hopefully they will start… from today, to lobby against every backward policy that will be initiated by the new Tory government. Only through struggle, from the left, the grassroots movements, the Trade Union Movement can the government be brought down to its knees. A new day will come to Canada, as it will to the rest of the world. We will all oneday rejoice in the sweet victory of the Working classes. We Shall Overcome! While he lives… his legacy must be accounted for. These are facts that cannot be denied. A total of 1.58 million people now live in poverty in Israel, half a million more than in 2000, when Prime Minister Ariel Sharon took office. The number of poor children has reached 738,000, up from 714,000 last year and 482,000 in 2000. And yet Israel claims to be the most modern of Middle East countries… Poverty must be the ‘in’ thing if that’s the case. Another aspect of the legacy is the treatment of Palestinian children. While Israeli children starve, Palestinian children get shot to death. And yet… some still claim Sharon is a man of peace….